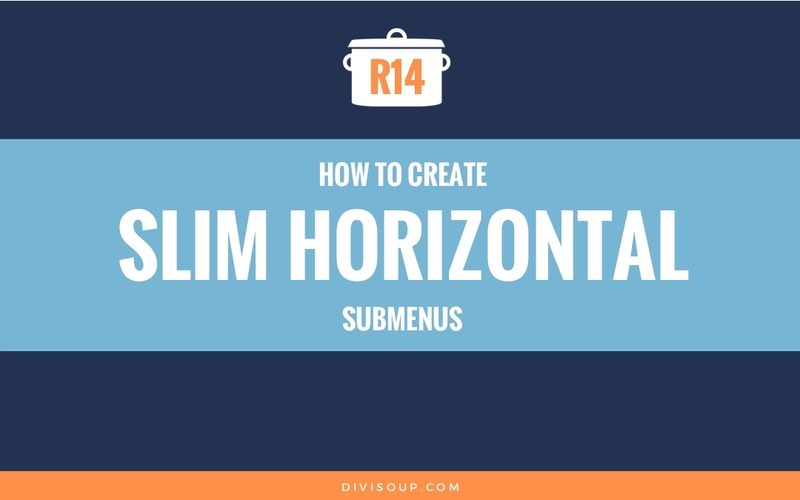 In Recipe #14 I’m going to show you how to create a sleek horizontal submenu with Divi. I am sure there was someone in the community who asked me about this but I can’t remember who , however I thought this would be useful for many as one of the major gripes designers have had with Divi is the lack of navigation design options. So hopefully this will add one more little trick to your arsenal, I know I am certainly going to use it! There is no real preparation for this Recipe, you just need to make sure you have your primary menu set up and have at least one submenu item. The code in this Recipe will work with Default, Centered and Centered Inline menu styles, it will have no effect on the Slide In, Fullscreen and Mobile Menu styling. It will also work with any menu animation you choose. I have provided the code for 2 submenu levels only, basically because I think any more than two levels is not great for user experience. You can easily extend the code for extra levels if you have them. And that’s it. Much simpler that you thought it would be I bet?. You can check out some more menu recipes in the Menu Category here. Each menu item has a unique ID, you can use that to target the submenus. Thank’s for this code. It helped me a lot ! I have just a small issue on my home. When i scroll the submenu scroll too. This generates a gap between the first and second menu. I don’t see it active on your site. Hi! Very Nice. What if I want to carry this out on a full-width menu ONLY? What is the coding to reduce the space between sub-menu items in Divi? I want to leave the drop down as is, but reduce the padding? Can you help? So you would reduce the 6px value to move them closer together. Want to divide sub menu in 4 columns. Thank you very much, Michelle. This code works well. The only problem I’m having is that the dropdown menus are not aligned left with the entire width of the page (directly under the top level menu). Can you please let me know what might fix this? Thank you! hey Michelle, your divi snippet is great…works good…. backround to maximum page size. How can I get it to just the boxed layout without getting over the borders ?? Do you have a link I can take a look at please Carsten? In Safari there is a small gap left of the submenu. It comes from -webkit-padding-start: 40px; for the ul. So i added a margin-left: -40px; to the .nav li ul to fix that. Q1. When I tried to put the codes in the Child Theme style.css, it didn’t work for me. It works when put I put the code in Divi Theme Options epanel custom CSS section. I always have a child theme installed, but never know how to put codes in there. Do you think I might installed the child theme incorrectly? Q2. Why can’t I get the two layers of the submenu in two different colours? Hello Michelle. Thanks for the recipe. I have tried the code in the child theme and in the Custom CSS like Michelle Wu, and it works in both places well. However, it does not work in the main parent theme’s style.css . I’m aware of the danger of this, it is just a local project where I do tests. Do you know the reason why this may happen? By the way, and if you don’t mind telling us, what’s the coolest plugin/service that you use for comments? It is the bomb! There is a CSS hierarchy in Divi, so putting the CSS in the places you have mentioned overrides the Divi stylesheet, as does a child theme. Placing it in the Divi stylesheet does not make the CSS more important than what is already there so you will get conflicts. Thank you so much Michelle, really nice and simple. Is there some easy way how to add delay after hover? I mean to keep the menu visible e.g. 0,5s after mouse leave the menu area. Do you have a link please Loren? One question, how can i set the second menuline to be visible after redirected to the linked page of the link? Doesnt work if you have “Borders LAYOUT” – the submenu width is through whole window and not match the width of the header. Second thing is what if you want the submenu to be vissible? the “visibility: hidden;” actually does nothing at all (tried to set it to visible or delete that row and no change at all). Thanks, this looks great on my site! Thanks for an awesome site, I use it all the time with great results! Probably that would need some JS Anna and not my forte, have you considered creating a fullwidth menu or sidebar menu for the subpages? Ok, thanks so much anyways! Your fix changes the space within the menu item, but not between items. And played with the values. Could not get it to work. What am I doing wrong? Also, I can’t wait for you other answer. 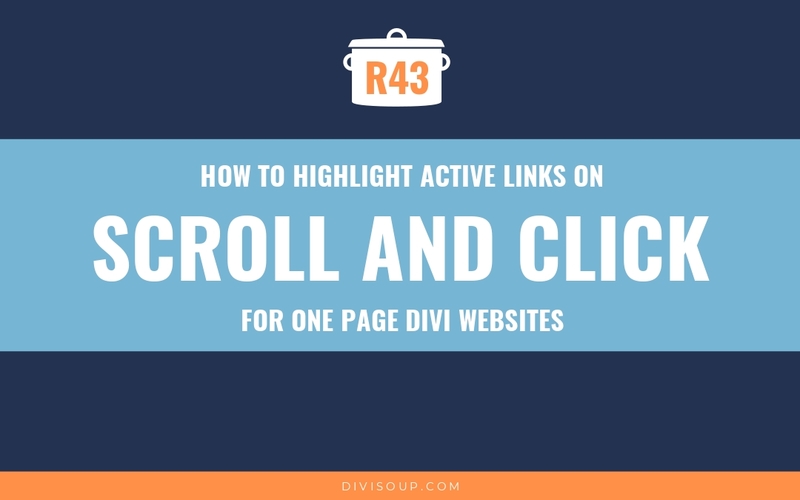 I think may Divi users with big websites (many pages) will be very happy with your solution. How can this effect also been used for the top menu? I wonder if we can fix the submenu once we are on a page in submenu level? Can you elaborate please Max? I am having no issues on the when on the sub-pages??? Hi – please pardon what is sure to be a ridiculously simple question but when you say “All you need to do is add the following CSS to your Child Theme style.css or if you aren’t using a child theme” – where do I find the “Child Theme style.css”? Where is it located? I really love your recipies!!!!!!! I have a problem with this menu, because my web is in a box with 1024 width, could you check for me, please? thanks a lot for your recipies. They’re great and easy to follow especially as I’m just discovering Divi. In case you ever run out of ideas I’m still trying to figure out a good way to make the blog posts fullwidth. When you say ‘I’m still trying to figure out a good way to make the blog posts fullwidth’ what exactly are you trying to get fullwidth? Hi Michelle, I absolutely love your recipes As a newbie to Divi and WordPress, I really appreciate all your tips and stuff! How did you create those social media icons with the hover effects on the top of this page? There is a “/” missing at the beginning of the line. It is preventing the code being executed. Probably this is the issue being faced by Lori Newman. That would explain it – it was missing on my child theme – thought I was going nuts LOL Thanks for catching that! I don’t see the first part of the CSS in your stylesheet Lori, I can see the second part but that won’t work without the first bit, if I add it in dev tools its working fine. Hi Michelle, It’s really strange, it was all in the child theme but not showing up, I put it in et theme options and it is working now- thanks this is awesome! It’s awesome. Thanks for sharing. Hmm… It’s not working for me. It moves some of the items to the right. Any ideas? Thanks! You have some custom styling on your menu Phil, probably using pseudo elements and maybe some conflicting CSS in your stylesheet. Lovely Snack, Michelle. Thank you!